Currently, Our users can’t bet with Sky Bet. 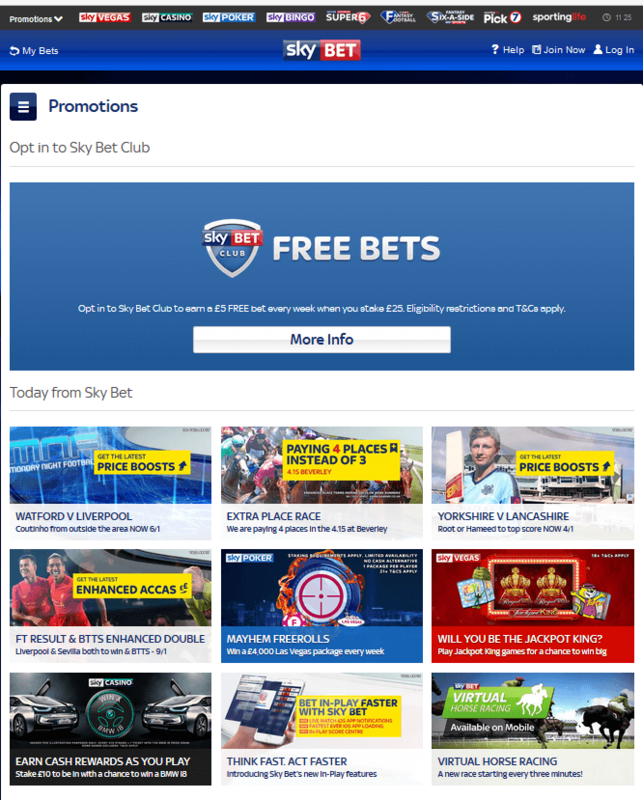 When it comes to sports betting in Ireland, Sky Bet, skybet.com, is one that is hard to beat especially when you consider this company’s marketing experience. In our BettingTop10 Review you’ll find out everything you need to know about this online bookmakers offers as well as payment methods, bonuses, terms and conditions, sports covered, live in play, and mobile betting. The sign up offer for all new customers is a €20 free bet. Below you’ll find our pros for this online sportsbook. Sky Bet offers special enhanced odds on selected matches and event and the website is excellent. Navigating your way around couldn’t be easier and the main screen has plenty of quick links that give you access to all the different sports categories. The in-play section can be found in a box on the homepage and it’s easy to jump from one things to another. The tools section has everything about horse racing and there is also a betting calculator. There is a link to the Sky Sports News Radio too. The website is fast and very responsive and there is an excellent betting slip. The site is available for mobile and tablet users too and there is a dedicated mobile app which is called Sky Bet Tracker and features everything including cash out options, stats, and more. The app is available for iPhone, iPad, and Android smartphones and tablets. Sky Bet offers odds on over 30 markets and the odds are competitive too. The most popular sports bets placed by punters in Ireland are on horse racing and football. There’s also golf, rugby, and championship games to bet on too. Sky Bet offers live betting and in-play options are available on lots of sports including football, super 6 golf, horse racing, tennis, rugby, and more. The prices for Handicap and fixed odds are available in decimal and fractional formats. There a lots of price boosts on different sports and they have a strong market coverage. There is a cash out option on live betting too as well as the best odds guaranteed on horse racing. The site offers free betting tips and virtual sports too. Sky Bet uses a number of different software providers for their various offerings. For their online bookmaker they use number one provider OpenBet and this ensures a fast, fully responsive site that is easy to operate and even easier for customers to use. For their online games they use Playtech. There are lots of deposit and withdrawal options available to bettors from Ireland and it is easy to manage your sports betting account. Payment methods include Visa, MasterCard, Neteller, Skrill, PayPal, and bank transfer. E-wallet withdrawals are the quickest and are usually completed within the same day. It can take between 2 to 5 days to withdraw to your bank or credit/debit card. The minimum withdrawal amount is €10 and customers can choose to set their own deposit limits should they choose to do so. There is no maximum cash out limit. The minimum deposit amount is €5. Sky Bet offer support through their help section. Players from Ireland can access the support team 24/7 via the support page http://support.skybet.com and there are several ways to connect with the team. The website also has a help section where members can choose from FAQs, registration, my account, payment methods, promotions, betting queries, sport rules, and more. The support team are excellent and very friendly too. Sky Bet is a popular choice for betting in Ireland and the sign up offer is a €20 free bet. This must be a single or each way €5+ bet at odds of evens or above. They also offer the Super 6 promotion that gives bettors the chance to win a massive jackpot. All you have to do is predict the correct results of all 6 selected matches. There are plenty of other promotions available as well as tips, online games, best odds, free bet offers, and more.